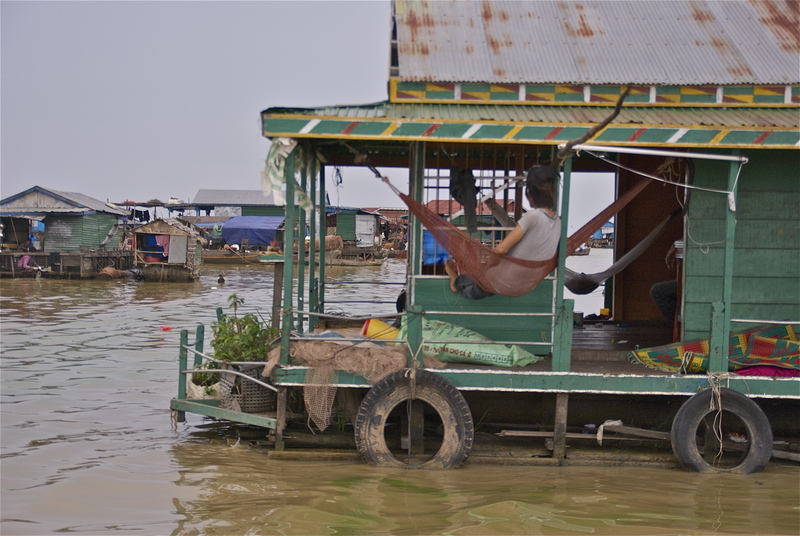 Cambodia’s Floating Villages | Life. Crazy. Beautiful. Sometimes crazy annoying, sometimes crazy beautiful – sometimes just plain nuts. Ever wondered what it would be like to live on a houseboat? Well imagine if your whole village was made up of boats. Your school, the pub – the local crocodile farm. I went to Cambodia to see Ankor Wat. Yet what has stuck in my mind is an image of a floating village. In a country where many people are very poor, some cannot afford land to build on. 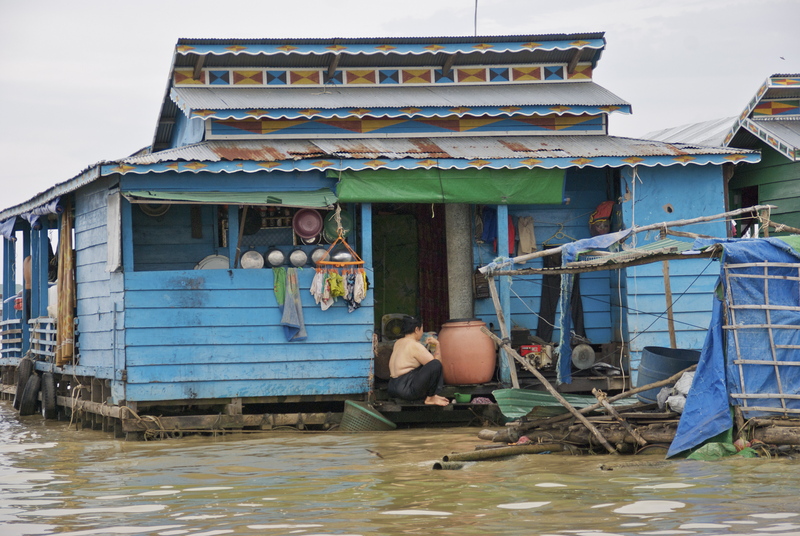 So they build their homes on boats, and live nomadically on the lakes and rivers, moving with the monsoon waters. When I heard about this, I was fascinated. I expected to see a few boats tied together, a point of local interest for tourists. 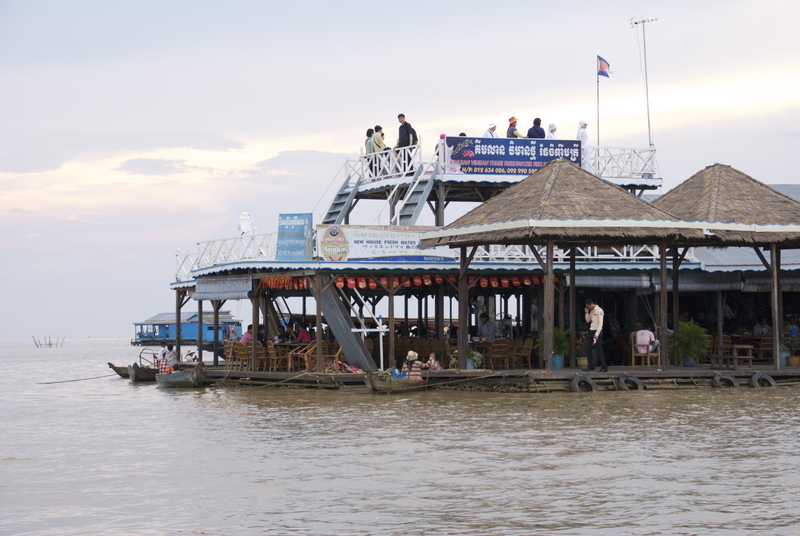 After travelling up the river and seeing a few houseboats here and there, I thought that was maybe it. And then the river opened out into a large lake – and I was dumbfounded. 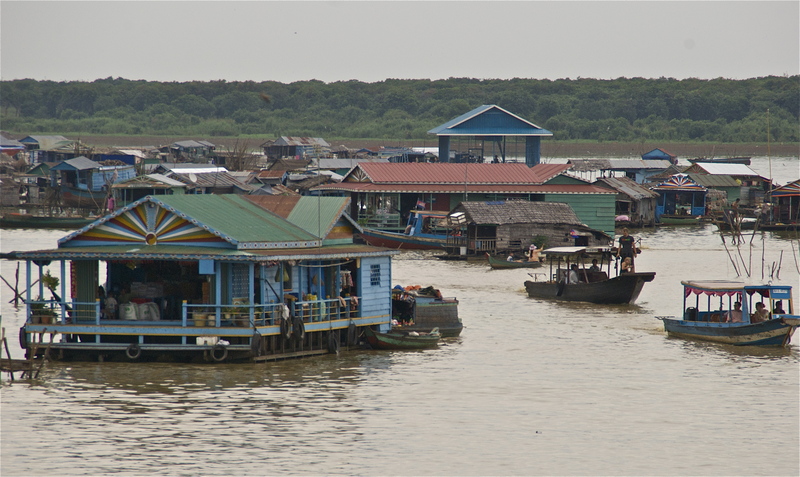 Here was a large thriving community, a true village, all on boats in the middle of the lake. 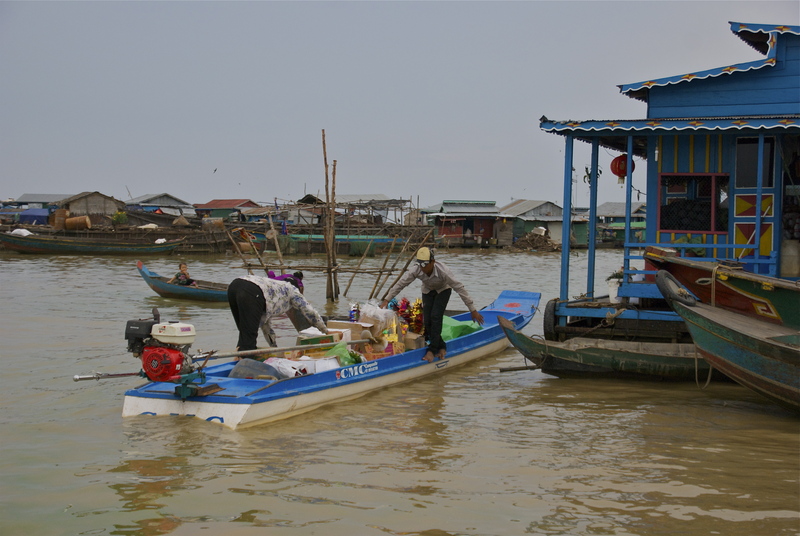 People were going about their daily business – cooking, sleeping, shopping – all on the water. The school was pretty impressive. And I had to giggle to myself when I saw more than one pub. It seems these are the basics in life, a school and a pub. Our little tour boat sidled up to one of the pubs, and we climbed aboard. The Swedish guy in our boat nearly jumped out the other side when a child approached him with a snake wrapped around their neck (give me a snake over geckos any day). This seemed to be clearly for the benefit of the tourists as far as I could tell. The snake was so incredibly passive we thought for a while that it was actually dead. It clearly wasn’t, but I wondered if it was drugged or something, the child was rolling all over it like a rubber toy. We were then taken to look at the crocodile farm. 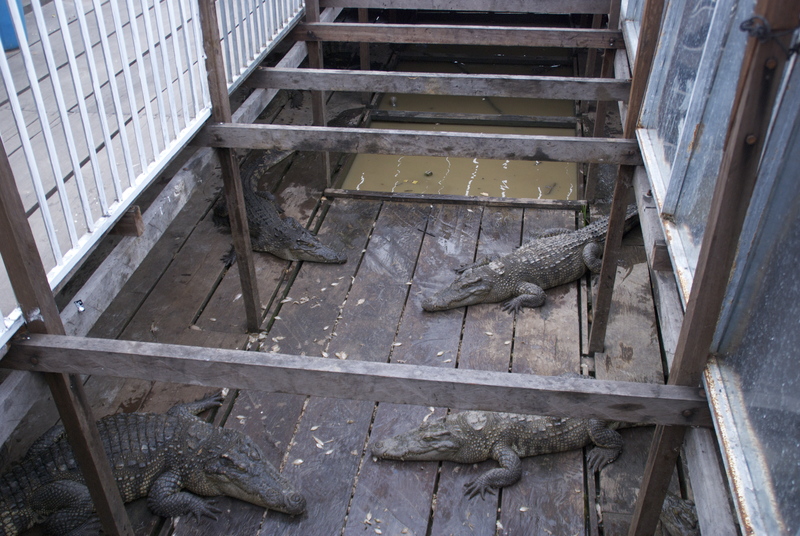 This was basically a section under the boat, with an open top, where the crocodiles hung out. I’m guessing they were well fed. They didn’t seem the slightest bit interested in us. The villagers generally all make a living catching fish for a local fishing company that (as far as I could tell) provides some of the community buildings and facilities. It was hard to tell how the life really is for the people there. Although they all seemed very happy, it can’t be an easy life. The adaptability and ingenuity of people always inspires me. It seems that, given half a chance, people will find a way to make a life for themselves, one way or another. 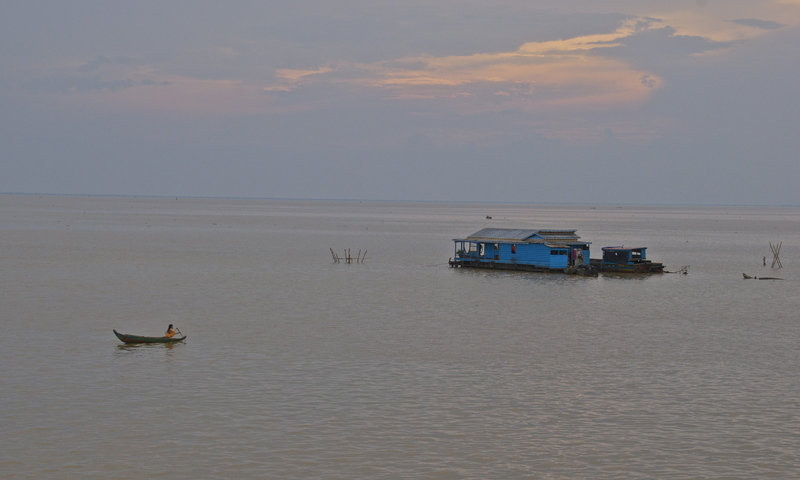 The people of Cambodia’s floating villages have found a way to build a life for themselves and their families. 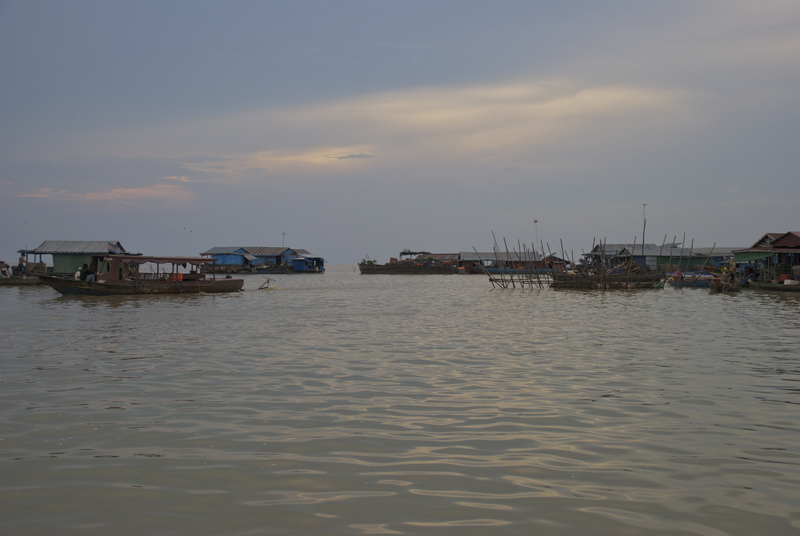 They may not have many choices, but what they have built, their floating villages, have an incredible beauty about them. As I was sitting there, watching the sunset over the water, I couldn’t help but think… somewhere else in the world right now there is someone working their guts out, saving all their pennies. So that one day they can buy a boat, sit on it, watch the sunset, and fish. 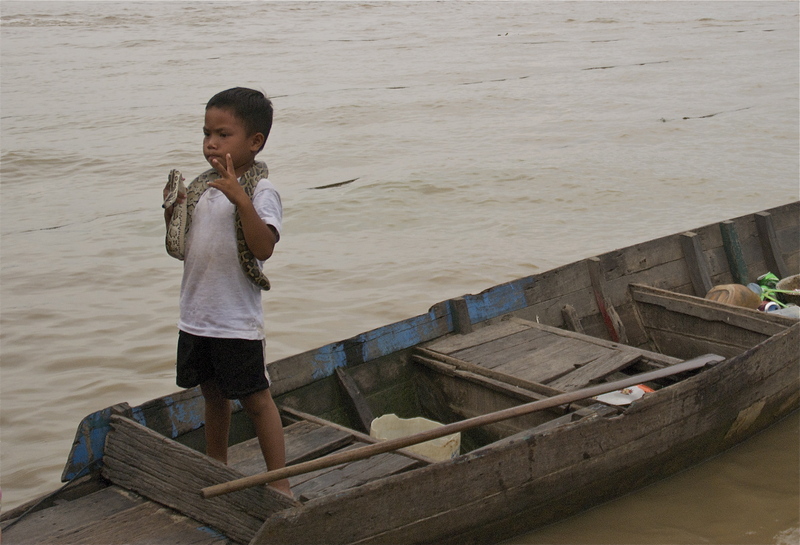 This entry was posted in Uncategorized and tagged Cambodia, fishing, travel by Nimmity. Bookmark the permalink.